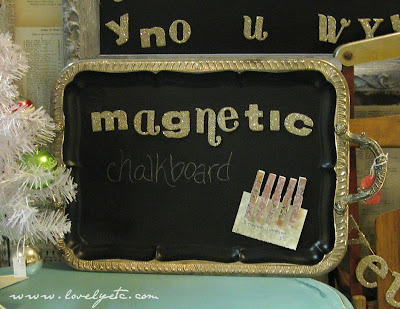 Sweet magnetic chalkboard - Lovely Etc. I started off with a vintage metal tray. I am not sure what type of metal it is but I know it is not real silver. (I know that because my tray is magnetic and silver is not). I started off by taping off the edges. This was actually the most time-intensive part of the project because of all the curves. I just tore off little pieces of tape and followed the curves with them. 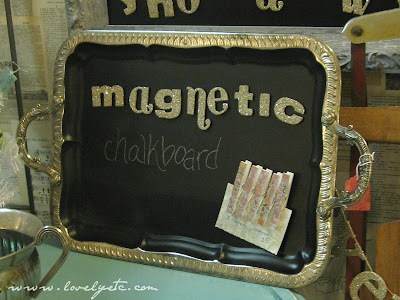 Then I spray-painted the tray with several light coats of chalkboard paint. When it had dried for 24 hours, I removed the tape and ‘primed’ the chalkboard paint by rubbing a piece of chalk all over it. And that’s it – silvery tray turned magnetic chalkboard. Love it! As you can see, I decked it out with some german glass glitter letter magnets a la Miss Mustard Seed. So what do you think? Anyone else played around with chalkboard paint lately? Cute… I really like that concept. Nice job! and yes, I got some chalk paint going down! Got an old, wide framed picture I am distressing & turning into the chalk board. Always a fun medium. Have a great day! I love it! I love the letters and clothespins!! so cute–thanks for sharing this week at Primp! Thanks for stopping by Lovely Etc! While every effort has been made to ensure the accuracy and effectiveness of the information displayed on this website, Lovely Etc. makes no guarantees as to the procedures and information contained here. The publisher will not be liable for direct, indirect, incidental, or consequential damages in connection with the information displayed on lovelyetc.com. This website is not intended to substitute for advice from a professional. I work hard to be honest and upfront in all of my posts here at Lovely Etc., including sponsored content. Lovely Etc is a participant in the Amazon Services LLC Associates Program, an affiliate advertising program designed to provide a means for sites to earn advertising fees by advertising and linking to amazon.com. You can read my full disclosure policy here. All of the photographs you see here are mine unless otherwise credited. I love for others to share my work so please feel free to use one photo with a link back to me. Pinning and sharing is always encouraged! Please do not reproduce other Lovely Etc. content without permission. Thank you! Logo design by Ken Oliver Design. Free guide to the best paints for every project! Plus get the latest DIY tips and inspiration in your inbox every week. Sign up for instant access to my library of free printable art! Sign up for free weekly emails full of DIY projects and tips and also get this custom checklist that makes it easy to get a perfect paint finish every time. Are you ready to DIY like a boss? I want the free printables! I want the free Cheat Sheet! Sign up for free weekly emails full of DIY projects and tips and also get a free custom checklist that makes it easy to get a perfect paint finish every time. I want the free gift tags!